The 'Area de Conservación Guanacaste' is a habitat for threatened or rare fauna species like the Saltwater Crocodile, False Vampire Bat, Olive Ridley Sea Turtle, Leatherback Sea Turtle, Jaguar, Jabiru Stork, Mangrove Vireo and Mangrove Hummingbird. The ecosystem ranges from 12 miles into the Pacific Ocean to the coastal dry tropical forest. The site comprises Santa Rosa, Guanacaste, Rincón de la Vieja National Parks and the Junquillal Bay Wildlife Refuge. In 2004 the original site was extended to include the Sector Santa Elena. Guanacaste Conservation Area is in the northeastern cantones (counties) of Liberia, La Cruz, Bagaces and Upala, spanning between the provinces of Guanacaste and Alajuela. This area comprises three national parks: Rincón de la Vieja Volcano NP, Guanacaste NP and Santa Rosa-Bolaños island NP, the recreational area of Junquillal, Horizontes experimental station and some smaller protected areas. The particularity of this part of the country, regarding the rest of the country, is it´s drier climate to the pacific side of the mountain slopes. 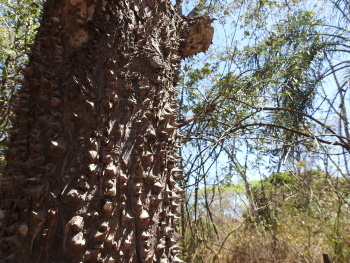 So, it´s considered the last relict of the dry tropical forest that sometime covered from Guanacaste to southern Mexico. With this respect, it´s the largest area to include such forest. It also has some other important aspects: the large biodiversity that it houses, somewhat different to what is usual in the wetter parts of the country, the savanna-type vegetation, the presence of different species such as: deers, coaties, monkeys, armadillos, snakes, etc. The marine part is also particulary rich and pristine in terms of biodiversity. Bolaños island is considered a sanctuary for marine birds, Junquillal and Naranjo beaches are extremely appreciated for their waves and rugged landscape, Santa Elena peninsula in Santa Rosa NP is the driest and geologically oldest part in the country and it´s in a great deal untammed by human action, Murciélagos islands are also representative of the historic and biological evolution of the area. Santa Rosa has the biggest section of dry forest, a mariine area, and coastal marshlands, and also has Nancite Beach, one of the most important beaches for sea turtles spawning in the Pacific Ocean. Santa Rosa is also important for costaricans is also representative of the country´s history for Santa Rosa hacienda, that even when it´s a reconstruction of the original hacienda (burnt in 2001), it´s stock corrales and the sites of three diferent battles (especially that one of 1856 when an unprepared costarrican army defeated a group of mercenary invaders from the southern states of the USA) are of great autenticity by their historical importance and representative of the history of Guanacaste as an area for cattle ranches. In terms of the importance of the ongoing biological processes, Guanacaste NP is the most important of the three, covering from the steppe-like vegetation on the pacific slope, to the high peaks of Orosi and Cacao Volcanoes, to the wet parts facing the Caribbean side. Rincón de la Vieja is well known as a park with two high volcanoes, a series of hot springs, mud volcanoes and other volcanic formations, a rich forest bordering pristine rivers and waterfalls, acid lagoons and other impresive landscapes. As a conservation area, Guanacaste is unique for it´s climate, the dry forest and the contiguity of all the areas, that makes easier the biological exchange among the areas. Even when threatened by stational wildfires and hunting, this area represents a microcosm of the variety of protected areas in this country. Guanacaste is now very popular as a gateway to the resorts in northern Costa Rica. It has been explosive since the airport opened in Liberia and hotels like Four Seasons in Papagoya became chic. There is much to do and I signed up for the zip line experience and horse back trail ride in the Rincon de la Vieja National Park. A highlight of the trail ride is a dip in hot springs in the forest. The one other highlight is to get near Tamarine Beach to watch the Leatherback turtles come up and lay eggs on the beach. I do not think the beach is part of Guanacaste but no matter. The quantity of turtles are diminishing rapidly. Their shells are 5-6 feet and are amazing to watch in the middle of the night. Critically endangered fauna species: Leatherback Sea Turtle - "Recent estimates of global nesting populations are that 26,000 to 43,000 females nest annually, which is a dramatic decline from the 115,000 estimated in 1980"
Recently Active Volcanoes: RincÃ³n de la Vieja - last erupted in June 2017 (including lahars that descended through some rivers on the northern side of the volcano). Crater Lakes: on the case of the Rincón de la Vieja volcano, there are two lagoons on craters, the one on the main active crater (a termomineral, hot lagoon) and the one on the Crater #5, also called Jilgueros Lagoon, a cold water lagoon in a densely forested area. Additionally, the Santa María volcano also has a lagoon. Pacific Ring of Fire: in general, the Costa Rican territory is in the Pacific Ring of Fire and is subject to earthquakes and volcanic eruptions. As such, the territory was formed because of the subduction of the Cocos plate under the Caribbean plate, forming the existing mountain ranges. The Guanacaste CA has one of the -considered- active volcanoes. Additionally, the Cocos Island NP is the highest point on the Cocos submarine mountain range, on the Cocos plate, has an extinct volcanic mount (Iglesias peak) and will eventually subduce under the Costa Rican territory. Sieges and Battles: Santa Rosa historic mansion was the site of battles in 1856, 1919 and 1955, but the most important was during the 1856-1857 National Campaign against the "Filibusteros", a group of mercenaries from the US and Europe that believed in the doctrine of the "Manifest Destiny" and after taking power in Nicaragua, intented to establish an English-speaking slavery state in all of Central America, very much on the style of the Southern US states. After their victory, the Costa Rican army proceeded to attack the city of Rivas, in Nicaragua. Foreigner prices: Santa Rosa National Park: Residents: ₡1.100 (not including $2 camping costs per night); Non-residents: $15 (not including $2 camping costs per night, ₡8.457 at today's exchange rate). Guanacaste National Park: Residents: ₡1.100; Non-residents: $15 ( ₡8.457 at today's exchange rate). Rincón de la Vieja National Park: Residents: ₡1.000; Non-residents: $15 ( ₡8.457 at today's exchange rate). Bahía Junquillal Wildlife Refuge: Residents: ₡2.000 (not including camping costs); Non-residents: $19 ( not including camping costs, ₡10.712 at today's exchange rate). Horizontes experimental station: Residents: ₡1.000 (not including lodging); Non-residents: $10 (not including lodging costs, ₡8.457 at today's exchange rate).